It might be unlike any pokies game you’ve played before, but Gemix by Play’n Go is a unique experience that is well worth your time. 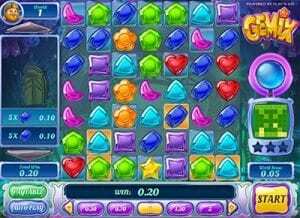 Greeting players with a 7×7 grid that resembles a game of Bejewelled more than a pokie, Gemix is a rewarding progression-based online game with plenty of innovative gameplay features and bonuses sure to keep you enthralled. Gemix is played on a 7×7 grid, which in pokies terminology would be 7 reels by 7 rows. As you can imagine, that alone makes Gemix an extremely unique pokie. If you’re familiar with Tetris, Bejewelled or Candy Crush you’ll immediately recognise Gemix’s fundamentals: simply match the bright gems in groups of 5 or more in any direction. Most unique about Gemix is that it offers a progression system, in which you must fill the pattern of shaded boxes. Each time you land a win for a coloured gem, if one of the boxes within that pattern is included in the win, that box is marked up. Fill the whole pattern and you’ll progress to the next level. 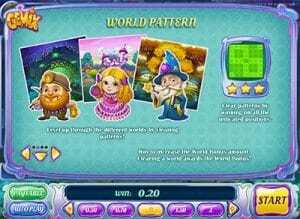 There are three levels in every “World”, with each World offering an additional potential Wild on a no-winning spins. It’s surprisingly enjoyable and plays a lot like a mobile puzzle game, which adds a unique element of differentiation between other pokies, which never really feel like more than just, well, a video slot. Gemix is a fascinating take on the pokies experience, and it’s what helps make it a highly addictive and fun game to play. Don’t be fooled by Gemix’s soothing aesthetic, childish theme and colourful gems: it’s a game with plenty of depth and a lot of replayability. The three worlds each offer a different theme and Wild symbol, and while these don’t really change up all that much as you progress through the worlds, it’s complimented well by the game’s great Bonus system, which rewards multiple wins on a single spin. Seeing the Bonus charge metre slowly fill up as you play is pretty exciting, and not knowing which bonus you’re going to get only adds to Gemix’s exhilarating gameplay. Much like the likes of Bejeweled and Candy Crush, Gemix knows exactly how to keep the gameplay fun and fast, and Play’n Go have done a great job of blending in big wins with a fun theme. The most disappointing thing about Gemix is undoubtedly the lack of a free spins bonus. I’m not sure how Play’n Go could have fit that in considering the nature of the game, but I’m not sure that excluding free spins and not offering much in the way of big jackpots is going to keep more experienced players spinning for long. That’s a shame, because Gemix is still a really solid online poker machine – if you can call it that. It certainly falls closer in line with mobile puzzle game, but you’re playing for real money here, utilising the same technology and odds as other pokies, so there is still plenty of big coin to take away from the game. There’s a huge variety of symbols in Gemix: red love hearts, pink moons, yellow stars, and a bunch of other coloured gems. Land a group of 5 or more of these symbols in any direction, and you’ll win a payout. The more connected gems in a spin, the more you win. The biggest possible payout is $500 on 15 gold stars, although you can win that much by working up the bonus meter on three or more consecutive occasions. As gems fall and are matched, they are removed from the grid, and so new gems fall to fill their place. This can lead to more connections, so as you can imagine you can win big on a single spin, so long as there’s a constant stream of connections as the gems fall. The game is split up into three Worlds, each with their own Wild. These Wilds are triggered randomly on a non-winning spin. Miner’s World Wild: Up to 10 Wilds, replacing all symbols in proximity. Princess’ World Wild: This lollipop Wild has an extra “spreading wilds” bonus. One of the symbols on the edge is picked, with the wild symbols moving vertically, horizontally or diagonally until it stops at a new edge on the grid. This can lead to huge wins. Wizard World Wild: Up to eight sticky Wilds can appear on a non-winning spin. There’s much more in terms of bonuses. Each time symbols cascade into place, a win can potentially open the gate to multiple wins on a single spin. Each win generates a multiplier, which can be seen to the left of the grid. So not only does one win increase your chances of another win, each corresponding win is marked with a multiplier. Chain Lightning: Two symbols in opposite corners will link up and turn each symbol in their path into the same corner. Light Beam: A ray of light turns all symbols in a horizontal and vertical cross the same colour. Crystal Warp: One symbol is randomly picked, and each symbol within that grid is changed to that colour. Nova Blast: A random symbol explodes and knocks out all symbols in adjacent blocks. Super Charged Crystal: A multiplier of 3x is applied to every win. It’s a fun bonus system that resets on non-winning spins, so you only have one spin to fill up the meter. This happens often, as blocks are constantly dropping with every win. These bonuses may not necessarily lead to big wins, but they can help generate a string of wins by turning a whole section of the grid into a single colour. It all ties into Gemix’s World system, in that these bonus charges help you take out more gems at a faster rate, allowing you to complete the pattern and move through the worlds towards faster Wilds. You can play Gemix at many of our recommended sites, which all host Play’n Go online pokies software. All are verified by industry watchdogs like eCOGRA, are safe and regulated for player deposits, and have hundreds more pokies on offer from Play’n Go and other game developers. Gemix is a truly unique gaming experience. It’s technically considered a “slot”, although it’s as far removed from the traditional pokies experience as you can get. Its lack of free spins is a bit disappointing, but it almost makes up for it in full with a constant stream of wins, and a Wild system that makes non-winning spins seem more exciting than they are. It’s a game worth checking out simply for how unique and addictive it can be.